TOKYO - The International Tokyo Toy Show 2018 (東京おもちゃショー) opened to buyers and the media on Thursday with “global” being a keyword for Japan’s largest toy industry showcase as it began a four-day residency at Tokyo Big Sight. 2018 marks the 57th edition of the annual toy show with organizers The Japan Toy Association (JTA) having gathered 51 foreign manufacturers to feature at the exhibition alongside 146 domestic brands, the largest number since its move to the current Tokyo Big Sight venue. Among the some 35,000 toys on show at the event, those selected for their global appeal include the girls’ collection, L.O.L Surprise -- a hit in over 90 countries and regions having already shifted some 500 million units. Organizers are also expecting toys from the Jurassic World movie franchise to create some buzz ahead of the summer release on these shores of the latest installment, Jurassic World: Fallen Kingdom. Latest additions from perennial domestic favorites at this year’s show include those for Sylvanian Families from Tokyo-based manufacturer Epoch, the animal characters continuing this year’s “global” theme with their popularity across 60 countries and regions, and toys from the manga series Beyblade, from manufacturer Takara Tomy. The International Tokyo Toy Show (ITTS) also serves as a showcase for the Japan Toy Awards, established in 2008 to encourage manufacturers to develop high-quality toys that stay abreast of changes in the market, with this year’s winners announced at a ceremony held in Tokyo earlier this week. Taking out top prize in the boys category was mechanical baseball game, “Baseball Game 3D Ace” (野球盤3Dエース) from Epoc with 2018 marking the 60th anniversary of a game which was released in its original incarnation in 1958. “This game has great nostalgic value for many people.” said an Epoch representative as he accounted for the popularity of the display at ITTS that features incarnations of the game through the years. 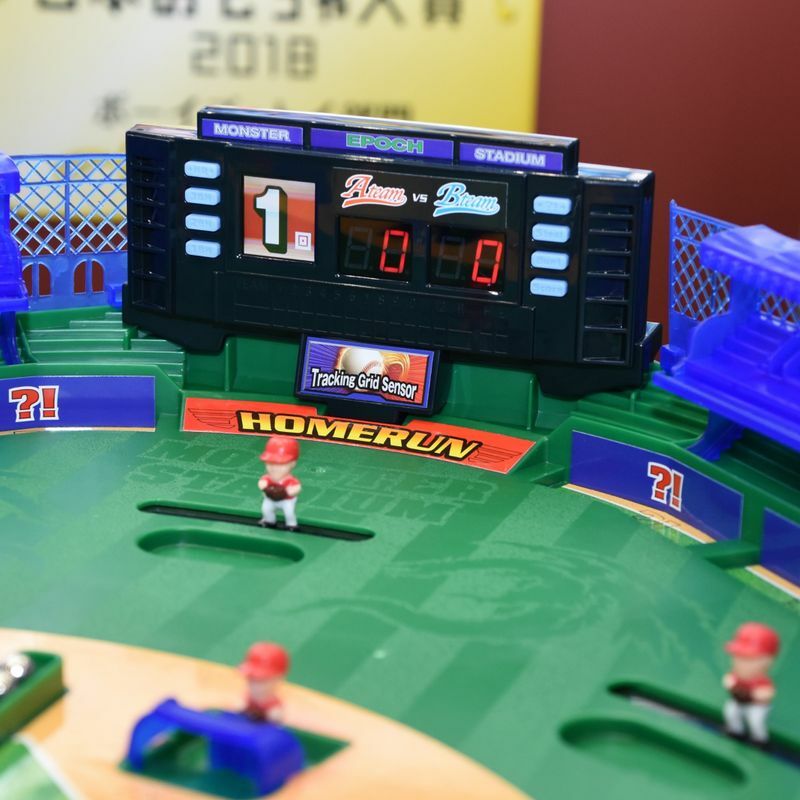 “It was released in the same year as Tokyo Tower was built and is the reason the company (Epoch) was established, to manufacture this toy.” In its latest, award-winning, guise “Baseball Game 3D Ace” features a “tracking grid sensor” which calculates the speed of the pitcher’s throws. It’s an upgrade which the manufacturers feel will help to deliver the sales when the game hits shelves this weekend, allowing “fathers to play they same game they did as a child, with their sons.” Despite ITTS’s appeals to the “global,” and Japan’s population decline, the domestic toy market appears in robust health, topping 800 billion yen for four years straight with sales in fiscal 2017 having been maintained in large part by the strong performance of girls’ toys, according to data compiled by JTA. The organizers then, are anticipating “heated” competition among girls’ toys at this year’s exhibition. Off to a strong start is Sega Toys who collected top prize in the girls category of the Japan Toy Awards with their Shuwa Bomb Cupcake Basic Set (しゅわボム カップケーキベーシックセット) with which consumers can make their own bath soap “bombs.” The award-winner is one of many appeals to Japan’s love of cute edibles at this year’s show, with donuts, crêpes, and dango all present in toy form. While many toys on display at the show celebrate the kind of charming simplicity that is often drowned out in an age of video gaming, the Internet, and VR tech, organizers have sought to showcase “new ideas” coming out of the industry. One such idea generating buzz in 2018 appears to be the BankWan / BankNyan (バンクワン / バンクニャン) from Takara Tomy Arts (T-Arts) -- smart piggy banks in cat and dog form which combine “toy” with IoT tech to produce a piggy bank that talks through a silicon-made mouth as it calculates how much money owners have saved. BankWan / BankNyan picked up the Japan Toy Awards for innovative toy. The International Tokyo Toy Show 2018 will be open to buyers and the media for the first two days before opening to the public on Saturday and Sunday.